You can learn a lot from your golf divots. Because your divots indicate the path in which the clubhead is coming into the ball. For example, if your divot is pointing to the right of the target this means you’ve approached the ball from the inside (if you’re a left hander and your divots pointing to the right it means that you’ve cut across the ball). If your golf divots are pointing to left it means that you’ve approached the ball from the outside (if you’re a left hander and your divots pointing to the left it means you’ve come from the inside). Obviously if your divots are straight at the target then that means you’ve come into the golf ball on a perfect path. Now the only other variable that determines where the ball goes is the clubface position at impact. Here are the combination’s and path so you can tell what has happened after the shot. If your clubface is square to the divot you’ll produce a straight push. If your clubface is open to the divot you’ll produce a shot going to the right and then fading/slicing. If your clubface is closed to the divot you’ll produce a shot starting to the right and then drawing/hooking. If your clubface is square to the divot you’ll produce a straight shot. If your clubface is open to the divot you’ll produce a shot going straight to the right. If your clubface is closed to the divot you’ll produce a shot going straight to the left. If your clubface is square to the divot you’ll produce a straight pull. If your clubface is open to the divot you’ll produce a shot starting left and then fading/slicing. If your clubface is closed to the divot you’ll produce a shot starting to the left and then drawing/hooking. So once you’ve determined the divot shape you normally get and the shape of shot you produce as a result of this and the clubface at impact then you should do the following — and this applies no matter what you’ve been doing. The path in which that the clubface is traveling is most important because, as you’ve just read, even if your clubface is square it only matters if the path is pointing straight at your target. 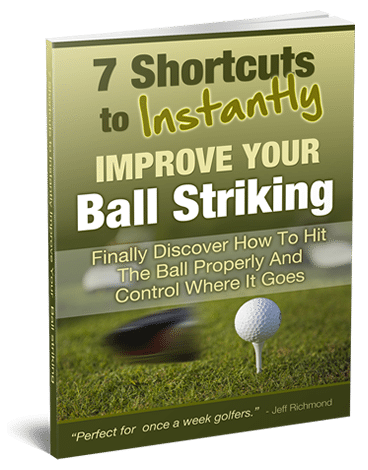 And besides, you cannot easily manipulate it while you’re swinging….but you can groove a consistent path and here’s how. Go out to the practice area and place a club down so it’s parallel left of your target. Now place a shoe box or something similar just outside your ball. Doing this will mean you are basically forced to swing down into the ball on a straight path. Because if you come from the inside or outside you’re going to hit the box. Simply keep swinging and you’ll notice a big improvement in your divots. But what about the clubface alignment at impact?Don’t worry about it. Simply by grooving a better path when swinging you’ll automatically improve your clubface positioning and this will happen at a subconscious level. Finally, just concentrate on the path first and the clubface alignment will take care of itself. If you do try to control the alignment while you’re swinging you might hit the ball straighter but as a result you’ll lose serious distance. And the reason for this is because whenever you “try” to do anything you create tension. And tension in the golf swing is one of the biggest reasons golfers don’t hit the ball as far as they could do. 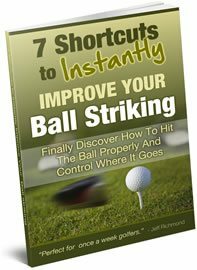 You know you play your best golf with a free and easy mind and swing, so use golf drills to train your swing and don’t try to manipulate it by giving conscious directions as to how the clubface should be positioned. Just simply swing and let it happen.